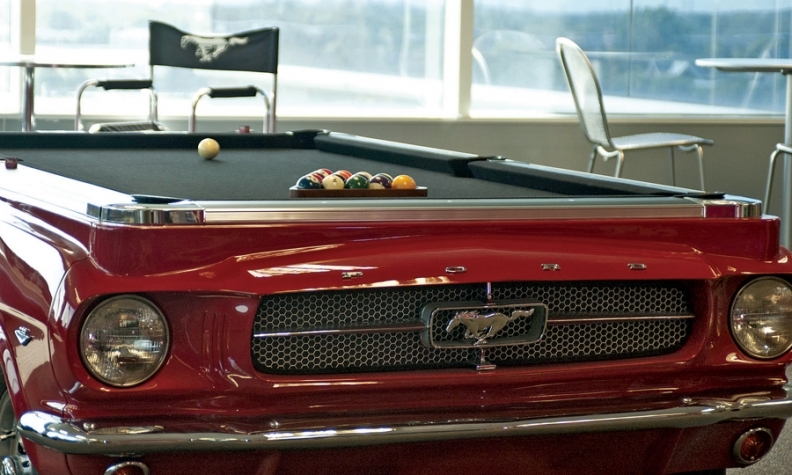 Ford Motor licenses its brands for all sorts of merchandise, including the Mustang pool table. DETROIT -- Patrick Mulligan has some of the best trained ears in the auto industry. When he hears a vehicle engine running, he can identify the car or truck much as birders can distinguish the calls of a robin from those of a cardinal. "I know what a Mustang sounds like and what a Camaro sounds like," says Mulligan, associate director for product development in Ford Motor Co.'s licensing department. He was editor of Scale Auto magazine before coming to Ford. So when Mulligan was evaluating a video game recently and heard a Land Rover diesel running while a Ford Explorer was displayed, he knew the sound was all wrong. Ford doesn't even sell the Explorer with a diesel. Ford asked the video game maker to correct the error. When Ford authorizes an image, sound or design for use in a toy, model, T-shirt or video game, it's Mulligan's job to ensure the end product is true to the Ford brand. It's all part of protecting the brand, says John Nens, Mulligan's boss and manager of Ford brand licensing. "The biggest thing about licensing is that it builds the Ford brand," Nens says. "Ford has a reputation that's been built up for more than 103 years. Our No. 1 job in licensing is to protect the brand." Ford is pushing to expand its licensing business. Sales of Ford-licensed merchandise brought in $1.5 billion at retail in 2011, Ford says. The company won't say how much it received in royalties from those sales, but the business is expanding. Among automakers, Ford is third, behind No. 1 General Motors and No. 2 Ferrari, in sales of licensed merchandise, Nens says. There's plenty of room to grow the business. Of the merchandise Ford licenses, 80 percent is sold in North America. "Our strategy is to grow internationally," Nens says. "We're trying to even those numbers out." Ford has about 400 licensees globally. About 45 million Ford-branded items were sold in 2011, up from 40 million in 2008, Nens says. "Ford sold 160,000 Mustangs last year. Mattel sold more than a million," Nens says, referring to Mattel's Hot Wheels model cars. "And video games are one of the fastest-growing areas we have. Eight Ford-brand vehicles are featured in the Need for Speed Most Wanted game." Ford's blue oval has become popular since the company refused federal bailout money. Mustang merchandise and F-150 pickup merchandise branded with the "Built Ford Tough" logo historically have been the top sellers. But in the years since Ford refused a federal bailout, goods with the Ford corporate logo have passed the vehicles in popularity. Mustang merchandise extends even to two-wheelers. "When we launched Mustang in 1964, we didn't think of registering Mustang as a category of bicycles. Somebody else took Mustang," Nens says. "Then when we wanted to do bicycles, we had to actually negotiate with the person who owns that." Another staffer in Nens' group, Mark Bentley, recently negotiated that deal. Soon, there will be Mustang-branded bicycles. Many would envy Bentley's job. He cruises toy fairs and video-game conventions looking for licensing opportunities. Ford is happy to license its image to toy makers such as Lego Systems Inc. and for use on sunglasses, T-shirts and even men's cologne. But the company deems some merchandise categories inappropriate. "We've been offered wine and Mustang beer. We stay away from those categories. The other thing we don't do is mature-rated video games," Nens says. "We've had co-branded opportunities with [firearms maker] Smith & Wesson. We just choose to stay away from the gun industry. There are some things you just wouldn't want to do because it's not a proper extension for the brand." Ford also won't allow its name to be used on coffins or burial urns. 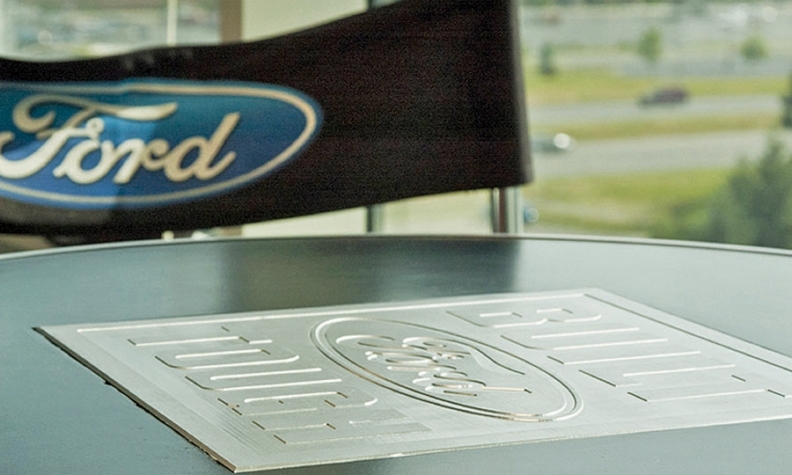 In most cases, companies approach Ford for permission to use an image, logo or sound. But Ford also works with licensees to promote its own products. When Ford introduces a new or redesigned vehicle, it licenses the exterior computer-aided design drawings to a model maker to build a 1:43 scale model. The model maker needs the drawings as long as nine months in advance to produce the small vehicles. Accuracy is much more difficult to achieve when reproducing scale models of older vehicles, for which no CAD drawings are available. That's where Mulligan's expertise comes in. If a licensee wants to build a scale model 1958 Edsel, for instance, it's Mulligan's job to examine the product carefully. Car enthusiasts will squawk about any inaccuracies, he says. "It has to be right or they will call you on it every time," Mulligan says. Nens marvels at Mulligan's skill: "I'd put him against anybody. He knows more about Ford products than anybody I know from 1903 to today."